Snacks and tips to help you succeed in changing your eating habits. Are you changing your diet? Are you consistently hungry hours before your next meal? Are you tired of failing the nutritional portion of health challenges? What if you had a program in place that would ensure you could eat guilt-free foods when you needed them? I’m Hungry! What Should I Snack On? 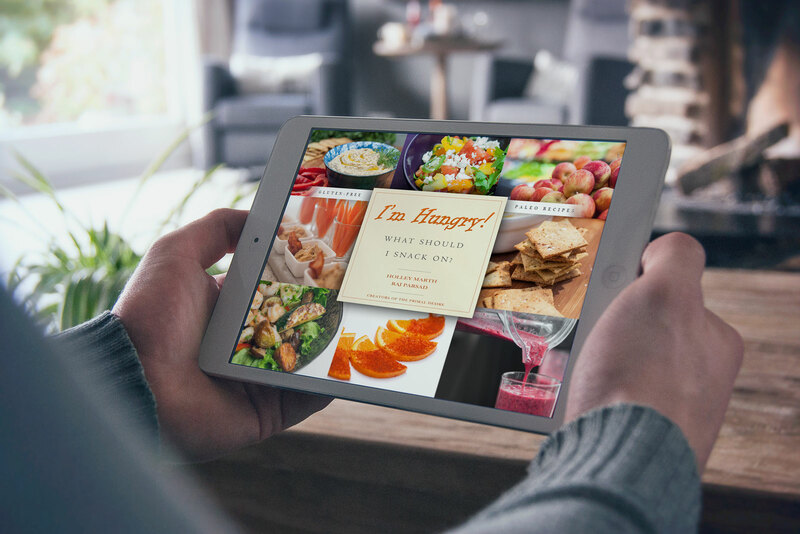 is our e-cookbook full of recipes, tips, and solutions to help you succeed by avoiding hungry mistakes and being prepared to battle the hunger with what you need: mouth-pleasing, body-nourishing food. Are you involved in a health challenge? A 30-day paleo challenge? New Year’s Resolution? Whole Life Challenge? Isagenix? TERRAfit? BeachBody? Are you paleo? Gluten-free? Grain free? Dairy free? Do you want to eat real food instead of highly-processed fast foods that are associated with multiple health issues? Have you been diagnosed with celiac disease, diabetes, or other chronic health issues? Do you have kids and a family who you’re feeding healthy food made with love? This book might be for you! I’m Hungry! What Should I Snack On? includes 70+ pages including 50 recipes – all adaptable for your specific needs and tastes. These recipes are all easily accessible, even to inexperienced cooks. the number of servings each recipe makes. the length of time it’ll take to make each recipe. ingredient list and instructions (obviously). easy-to-find ingredients (and we help you with the ones you may not have). our slick tips and insights to help with successful completion and understanding about the dish. Order now and get these FREE Exclusive Bonuses! Shopping list – List of foods to keep stocked in your kitchen and the building blocks for fueling your body. Motivational pages to keep you on track with your goals and commitment to your health. A printable plan for when you’re hungry, so you know exactly what you’re going to eat to avoid moments of weakness.